The first flavors to hit my tongue is a tangy sweet, almost fruity like apple, but vinegary. The heat comes in right away. The chewing brings on more sweet, but with a noticeable sriracha flavor. There's some garlic that comes in late, along with black pepper. For being labeled, "Smokey Sriracha", the sriracha flavor develops over the chewing eventually taking on that familiar Thai "rooster sauce" flavor, but with a little more vinegar, and a lot more sweet. I don't really taste any of the smoke that this jerky variety claims, however. As for the heat being the main star, there definitely is a fair amount of heat to this, enough to rate as "medium" our our heat scale (level 3 out of 5), but I wouldn't quite say that it's the main star. 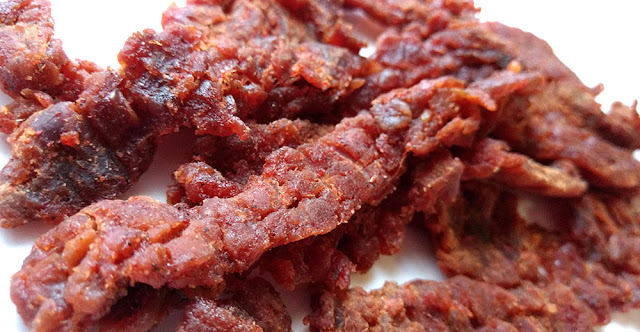 Otherwise, the primary taste profile is a thick sweet with a noticeable fruity vinegar, finally bringing in the sriracha sauce, along with some light seasonings of garlic and black pepper. The meat consistency is great for a brisket-style jerky. 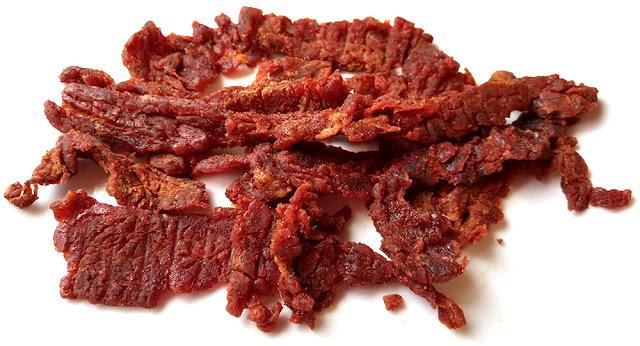 It has a light stringiness, but overall meaty. The chewing is generally easy, quite moist, and tender. It has a meaty feel, and takes on a steak-like texture. 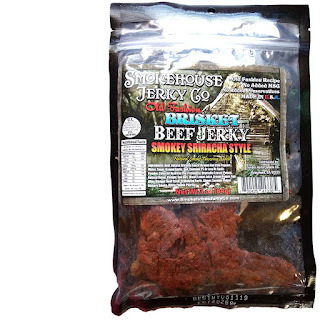 This Smokey Sriracha variety from Smokehouse Jerky Co. adds some unexpected twists for a Sriracha style jerky by making it extra sweet and dousing it with a fruity vinegar before finally introducing the famed Thai rooster sauce condiment. You also a get a decent level of heat, perhaps a little more so than what is normally offered in sriracha sauce, yet still remaining snackable without scalding the tongue. The extra moist slices of brisket are tender yet meaty and take on a soft, steak-like chewing. Despite having the word Smokey in the name, it's not that smokey at all. It's really more sweet than anything else, yet an interesting take on a popular jerky variety.